The Rebel Sweetheart. : Fashion Pulse | Trendy Black Dial Watches for Men. Fashion Pulse | Trendy Black Dial Watches for Men. Black is the color that defines style, sophistication, and panache like no other. It is a colour that is versatile and goes well with both formal and casual outfits. Here is a collection of some of the trendiest watches for men with black dials to spice up your wardrobe and add sparkle to your collection of luxury watches. These exclusive timepieces are available in all Ethos stores across the country. 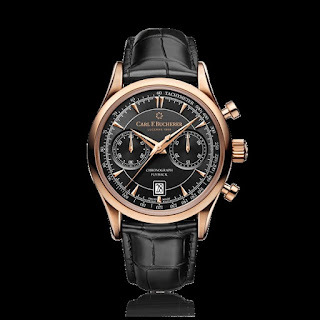 Carl F. Bucherer Manero Flyback. The Carl F. Bucherer Manero Flyback is a showstopper. The classic black dial and black leather strap set off by the rose gold case are sure to attract envious glances. 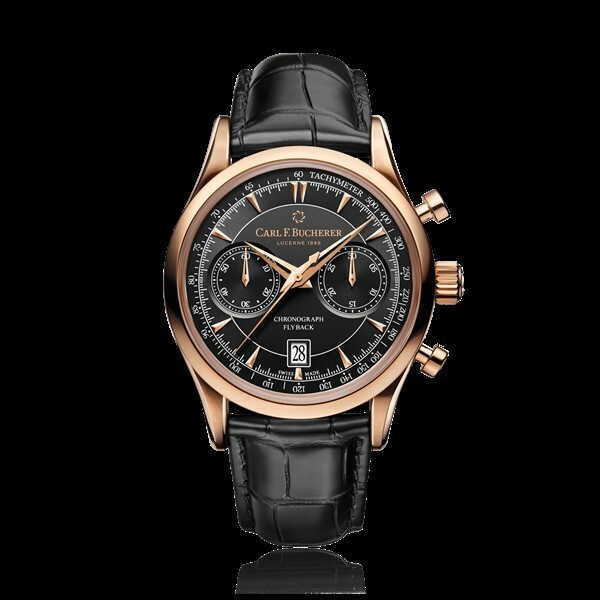 The chronograph with the flyback function makes it the owner's pride. The hour markers and the hands are also rose gold. The promise of Swiss engineering and the classic good looks take this watch to the top of our pick when it comes to trendiest black dial automatic watches for men. If you thought complexity does not go well with fashion, think again. Better yet, gift yourself a Raymond Weil Maestro. 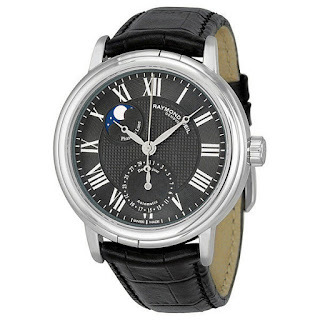 The Maestro collection was launched in 2010 and this black on black model has been a coveted timepiece ever since. The jet black dial is offset by the silver case and silver Roman hour markers. The two sub dials showcase the phases of the moon and the date. This makes your watch as unique as your personality. The black alligator leather strap spells luxury and style. Hublot Classic Fusion Chronograph 45 MM. Hublot is one of the top brands when it comes to luxury watches. 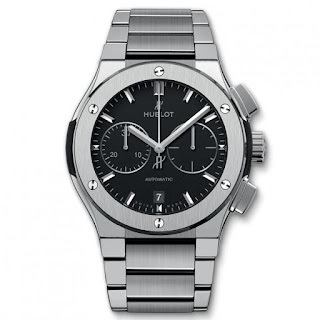 Hublot watches are considered style statements and are often passed down as family heirlooms. 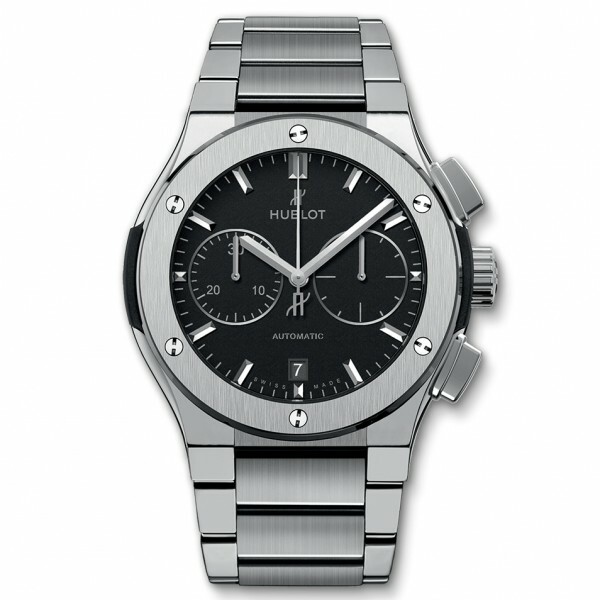 The Hublot Classic Fusion Chronograph 45 MM is one such treasured timepiece featuring a black dial and a titanium case. The steel bracelet and the steel hour markers add to its classic good looks. The two sub dials feature a chronograph and add elegance to this masterpiece. 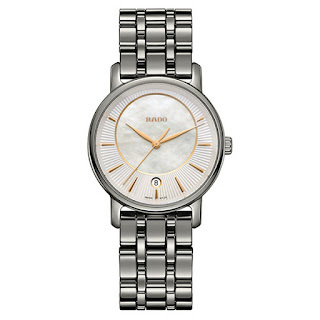 If you are a connoisseur of luxury watches you are sure to count Rado among your best, most loved possessions. Here is an all-black Rado that will let you step into the limelight. 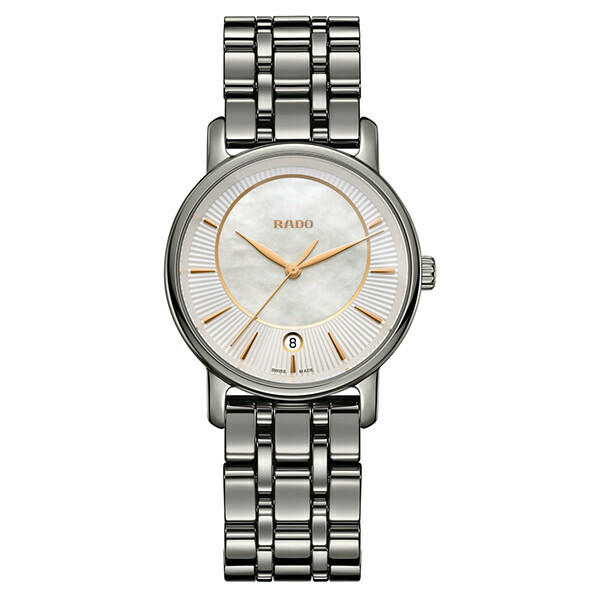 The Rado Diamaster XL Automatic is a clean and classic beauty with a black dial. The power reserve indicator and the date window complete the dial and the black ceramic case adds to the fashion quotient. The black leather strap is a comfortable but elegant one. Aesthetics and precision – that is what puts this watch on our list of black trendy watches you must own. Designed in the 1980s for the Italian Air Force aerobatics team the Chronomat collection of Breitling is known for its sturdy construction, precise timekeeping, classic aesthetics, and bold appeal. 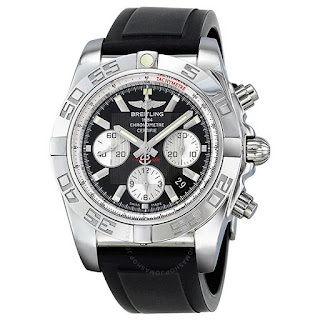 The Breitling Chronomat 44 features a sporty look with a carbon black dial and a steel case. The automatic chronograph movement is the highlight of the watch. The sub dials feature a chronograph and a date display window. The black leather strap completes the beauty of this timepiece. The Jaeger-LeCoultre brand spells excellence and superior Swiss engineering. Add to it the stunning aesthetics of the Polaris collection and you have a winner on your hands - quite literally. This model is a stunning black dial timepiece featuring a chronograph and a tachymeter. The jet black dial is matched by a fine black leather strap. The case and the hour markers are stainless steel making it the perfect accessory for both formal and casual dressing. I don't wear a watch and neither does my hubby but these are all so swanky! Maybe I'll surprise him this Christmas with a nice watch . . . it adds a touch of class I think. These look like great watches. I'm sure my husband would love these!! Wow, these are nice and cool styles of men watches. It looks like a perfect gifts for my dad's birthday this month. These watches are pretty awesome! I think it would be a lovely gift for our loved ones! What gorgeous watches these are, they would make really lovely gifts! 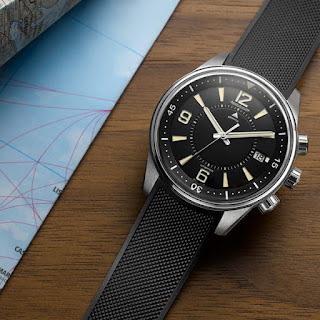 I am very impressed with the Jaeger-LeCoultre Polaris! I think nice watches are coming back in style. Both of my grown boys have purchased one. I like this black face. This looks so pretty. it seems to be perfect since my husband birthdays is next month. I have to look into this. Ooooh my husband would love these! I definitely need to get him one. Wow! Fall in love with this one - Jaeger-LeCoultre Polaris! Checking it out. Would be a perfect gift for myself. Spotlight | Althea Real Fresh Skin Detoxer. Seoul Searching | BT21 at Line Friends Store. 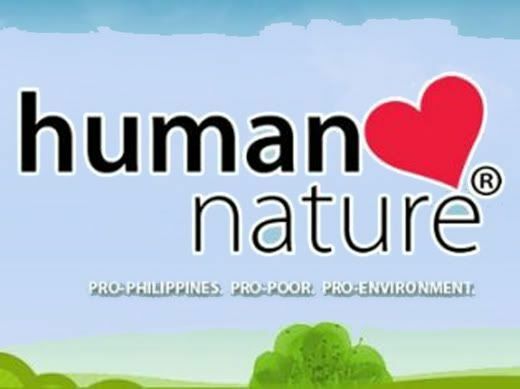 Tips and Tricks to Prepare for a Perfect Holiday. Foodie Goodie | Hongdae Hits! Picking The Best Child Care Facilities. Spotlight | The Face Shop x Coca Cola Collection.